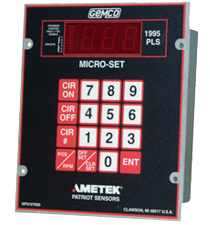 The Gemco 1995L Series Micro-Set programmable limit switch (PLS) with LDT input is designed for use in linear machine control applications. It incorporates many features for safe, efficient machine automation. This completely self-contained PLS can turn up to 30 independent outputs on or off based on the position of a linear displacement transducer or feedback from other analog devices such as pressure transducers, potentiometers, etc. It offers 0-10 VDC input with a built-in power supply for feed to a linear displacement transducer. Other input voltages are available for use with other devices.